FOR ALMOST TWENTY YEARS, TEACHER ANTONIO LA CAVA HAS BEEN TAKING CULTURE TO THE SMALLEST AND REMOTEST COMMUNITIES ON AN APE CAR CONVERTED INTO A TRAVELLING LIBRARY. READING, WORKSHOPS AND EMOTIONS, NOT JUST FOR CHILDREN. 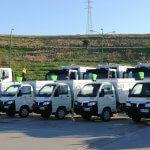 MORE THAN 180,000 KM COVERED TO DATE, TO VILLAGES WITH FEWER THAN ONE THOUSAND INHABITANTS. AND THE JOURNEY CONTINUES. 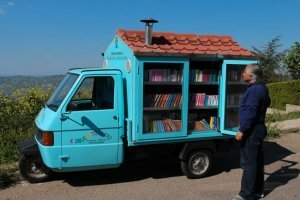 Antonio La Cava, a 73-year-old native of Ferrandina (Matera, in southern Italy), has an impressive 42 years of committed service as a primary school teacher; between 1999 and 2000 he created the “Bibliomotocarro” library, which, since then, has travelled non-stop to small villages (up to 1,000 inhabitants), taking books, culture and happiness to children (and their elders). His ally in this endeavour is his Ape Car 500 converted into a travelling library, which climbs up to altitudes of more than one thousand metres, to reach the remotest communities. So far the teacher and his trusty Ape have covered more than 180,000 kilometres together, of which 50,000 in the last three years alone. 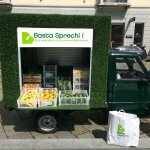 Antonio La Cava drives up to 200-300 km a day, and doesn’t stop even in the summer – “the Bibliomotocarro never goes on holiday!” – taking books and fun as far as the coastal villages of Basilicata (and up to the provinces of Bari and Lecce in the region of Puglia). His scheme, covered by newspapers and TV, has won wide recognition and provided the inspiration – as the exemplar with almost twenty years of experience – for similar initiatives.